In the bowels of the Savoy Hotel, the Beaufort Bar has become renowned for its glorious, regularly changing drinks menus. Celebrating the hotel bar’s theatrical history, a new menu – ‘Music, Magic & Drama’ – has recently launched. Seeking to distinguish the Beaufort Bar from the world-famous American Bar, the new menu hopes to elevate the hotel bar experience through a refined signature offering, filled with expertly prepared mixed drinks. Conceived by Assistant Bars Manager, Joe Harper, and the newly appointed Head Bartender, Elon Soddu, as well as the whole Beaufort Bar team, the new menu is inspired by the three founders of The Savoy Theatre – dramatist WS Gilbert, composer Arthur Sullivan and hotelier Richard D’Oyly Carte. Taking inspiration from past memorable musical performances at The Savoy, the menu begins with the ‘Music’ section, designed for the early evening at the Beaufort, previously home to the hotel’s cabaret stage. Here, light mixed drinks predominantly feature vodka and rum, teamed with fragrant and effervescent ingredients, plus a focus on grower Champagnes and English sparkling wines. “There will likely be a time next spring when English sparkling wine sees more popularity than ever,” a waiter explains while gracefully pouring two glasses of Rathfinny Blanc de Blancs, 2014. He’s talking about Brexit, of course, without once uttering the ‘B’ word, passionately describing the different sparkling wines available on the new list. As well as championing English sparkling wine, with an enviable list featuring local estates such as Rathfinny, Hush Heath, Ridgeview, Coates & Seeley, Gusbourne and Chapel Down; Grower Champagnes are available from estates such as Paul Dethune, Larmandier-Bernier and Jacques Selosse, to name a few. Prestige cuvées also include Dom Pérignon, Cristal 1979 and Krug Clos d’Ambonnay. Made in Sussex with 100 per cent Chardonnay, spending 36 months on the lees, Rathfinny’s inaugural Blanc de Blancs is an exceptionally delicate wine with tentative lemon notes alongside orchard fruits, apricot and brioche with a clean, dry finish. By seven o’clock, the dark, opulently decorated bar (£40,000 was allegedly spent on lining the bar’s six alcoves with gold leaf) begins to fill and become atmospheric, while service remains efficient. All bar and waiting staff have encyclopedic knowledge of the new drinks menu, happy to advise and recommend cocktails based on preferences. While waiting for the drinks to be mixed at the raised bar, live music trickles into the space from the hotel’s tea room, next door. The menu’s ‘Magic’ section focuses on liquids that have been manipulated on their journey to the bottle, through added botanicals, fermentation or fortification, including spirits such as gin, mezcal and tequila. From the section’s cocktail list, ‘The Elixir’ (£30) is based on a love story whereby a sorcerer creates a love potion causing people to fall in love with the first person they see. Featuring Don Julio 1942 tequila and mezcal, the drink also comprises less typical (unexpectedly suitable) additions such as Aperol, salted strawberry, lime and wormwood extract. Finally, the ‘Drama’ section celebrates dark, atmospheric drinks with emphasis on whisky, Calvados, Armagnac, grappa and Cognac. The bar’s list of world whiskies is particularly impressive, with mixed drinks typically minimal, allowing the spirits and their uniqueness to prevail. ‘Only the Finest’ (£20), for instance, is a complex hybrid between an Old Fashioned and Boulevardier, based with Woodford Reserve double-oaked bourbon, Campari and Cocchi Vermouth Di Torino, embellished with a dash of Pedro Ximenez and caramelised sesame which adds tremendous depth. ‘The Lost Notes’ (£25) is another complex cocktail, but served long, teaming Redbreast 12-year-old whisky with mango, peach liqueur and Rinquinquin aperitif peach wine which adds a refreshing, tropical slant. 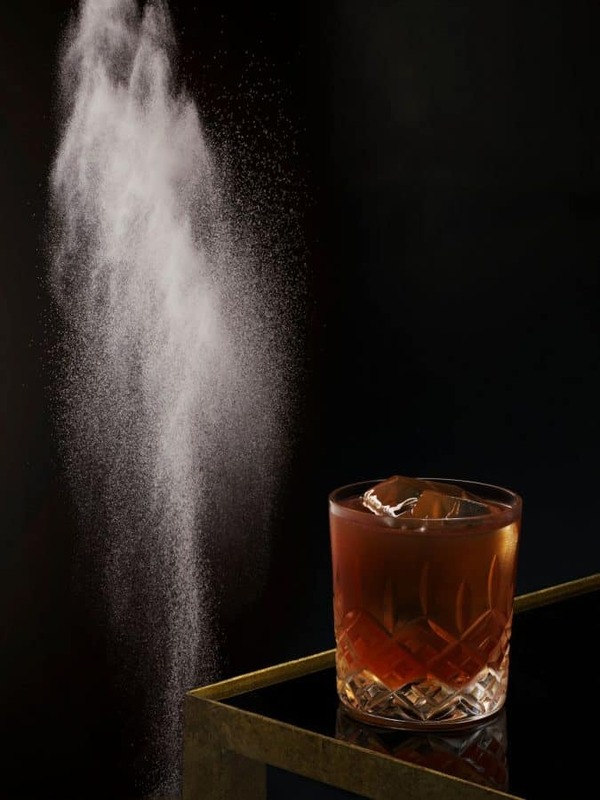 Inspired by Oscar Wilde’s ‘Salome’, ‘Tough Love’ (£50) is one of the bar’s more expensive cocktails, based with Johnnie Walker Blue Label. Purists will – understandably – condemn using such a premium expression as a cocktail base, yet the smoothness of the blended whisky is remarkable alongside the richness of sauternes dessert wine and plum skin cordial, clipped with underlying bitterness from Cynar amaro. In addition to the innovative drinks menu, The Savoy Executive Chef, Frabrice Lasnon, has created an accompanying food offering, designed to complement the drinks served. Dishes include caviar with subtle onion jam and beetroot crème fraiche; rock oysters with a dollop of lemon jelly; ‘Oriental Sliders’ – steamed buns with slow cooked short rib of beef; smoked venison; and desserts such as apple pie or iced fruit salad. A rich accompaniment to the expensive yet generally remarkable drinks served at one of London’s most unremittingly luxurious drinking dens. The Beaufort Bar can be found at The Savoy Hotel, 99 Strand, London, WC2R 0EU.